Join us every month for our Study Abroad Social Hour. This is an opportunity to mingle with staff and students. 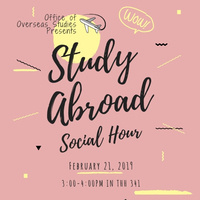 Get your questions about study abroad answered or just grab a snack and hang out.